This Saturday night Avalon Raceway will conduct the final round of the 2019 SRA 360 Sprintcar Indy Race Parts Triple Crown Series doubling as the Diggers Cup in honour of the Anzacs. Last weekend’s round winner Matthew Reed heads the list with runner up Michael Tancredi and third place Brett Milburn entered to continue their battle in this final round of the Series that is presented by A Plus Powder Coating. With all the drivers from round two of the Indy Race Parts Triple Crown Series entered once again there are some other big name drivers joining in for this weekend’s event. John Vogels, Terry Rankin, Jordyn Charge and Brayden Parr who normally compete in the 410 sprintcar ranks will add plenty of fire to this race event. Also regular 360 competitor Phil Lock will be in the mix along with a couple of other notable regular 360 competitors, Boyd Harris and Travis Millar. The Triple Crown Series Diggers Cup has been conducted on two occasions at Avalon Raceway with Brett Milburn taking the win back in 2017 then he was runners up last season 2018, Brett has a good success rate in 360 sprintcar competition and should be right in the fight for the top spot again this weekend. Michael Tancredi is the defending Triple Crown Series / Diggers Cup winner from last season and with his good form after taking second place last weekend Michael will be hard to beat here once again. Matthew Reed took second place in round one of the Series then followed that up with the feature win in round two last weekend, with the form he has been showing don’t count Matthew out for another win and to take the top points in the Triple Crown Series for the Indy Race Parts top four awards. 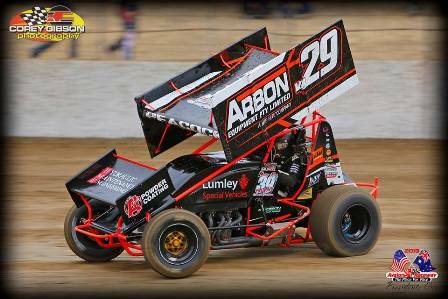 Chris Solomon has been very strong in his sprintcar racing over the last five or six weeks with some very good results and a win from Chris will not be a surprise this weekend. One driver having his first taste in the 360 Sprintcar competition is Mark Carlin, while Mark is relatively new in sprintcars in the 410 ranks he has been improving each time he races and a top ten or event a top six is not out of the question for him. Jesse Nicholas had a disappointing round last weekend when engine problems that halted his night after hot laps, Jesse will be back this weekend with his spare engine in the car. Eddie Lumbar, Michael Cunningham, David Donegan, Chris Campbell, Daniel Scott and rookie drivers Marcus Green and Mitchell Smith are some of the other drivers nominated. The 2019 SRA Indy Race Parts Triple Crown Series / Diggers Cup feature win is an open affair that could go to any of possibly six or seven drivers, Matthew Reed, Brett Milburn, Chris Solomon, Jordyn Charge, John Vogels, Brayden Parr, Michael Tancredi, but with the quality of drivers in the feild there are few others that will be right in the hunt on the night. The event will get underway with time trials to be followed by the heat races and three shootouts for Pole Position before the B Main event and the all important Main event, the 2019 Triple Crown Series Diggers Cup. Round 3 13/4/2019 - Avalon Raceway Lara – The Diggers Cup.